Oh dear, these are the sweetest things ever. I don't think the photo really does them justice. 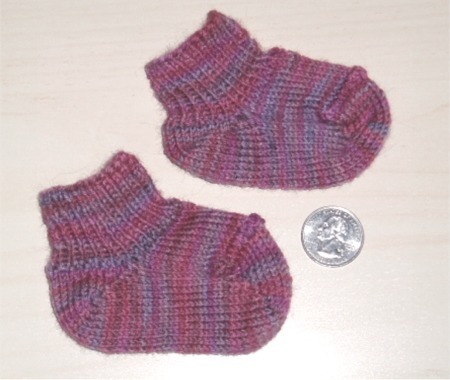 These are based on the Ruffled Rib Better Than Baby Booties from the Summer 2005 IK, knit in leftover Shepherd Sock in the Valentine colorway. I left off the ruffle and was so excited I forgot to rib down the instep. My short row heels and toes are getting a little better but I'm still getting small holes from the final YO. Even though it's knit to an adjacent stitch it gets so stretched out it leaves a hole. But I still had yarn left. 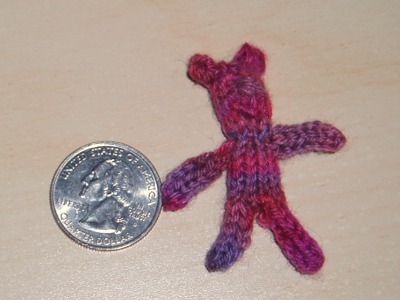 From the same IK article, Evelyn Clark's Itty Bitty Bear. Let me tell you she is not kidding when she says "itty bitty." So tiny. And best of all. 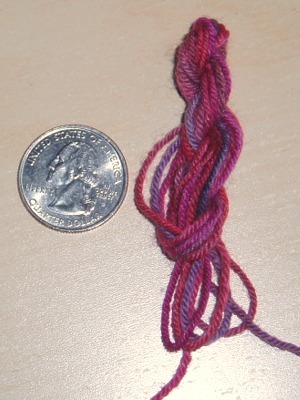 This is all the yarn I had left when I was done.